While ants tend to hibernate in winter months (in cold weather areas), termites can stay awake and bustling in the winter season. They may tunnel further below grade, or venture further into your comfy home to keep warm. All this relocating activity may limit their ability to find food and reproduce, which is why termites finish swarming season before the coldest months. The exception here is that if termites are colonized well within the confines of your warm house, they will be more productive due to hardly being affected by the cold. How Do I Know If Termites Are In My Home? Bubbles in drywall or paint – usually piles of termite feces can be found near or below. 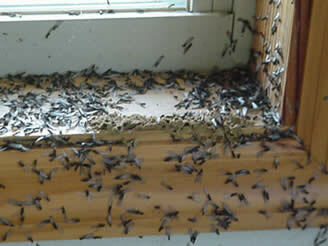 Termites will colonize aggressively, literally eating your house down to and including the structural beams. They are tenacious, and their ability to infiltrate hard-to-reach areas of your home make them difficult to exterminate. This is why tenting is an effective means of termite control. The damage cause by termite infestation is expensive, which is why getting a termite inspection and termite treatment plan is best done sooner, as opposed to later. The sooner you contact a termite inspector and begin termite control, the less expensive your repair costs for replacing damaged wood will be. The good news is, at termitepro.us, we make it fast and easy to schedule your termite inspection online, without having to wait on the phone, or go back and forth with an inspector to schedule the day and time. Just go to termitepro.us, enter your zip code, and schedule your appointment on the calendar. Our highly qualified inspector will arrive on-time, ready to help control your termite or pest control problems.